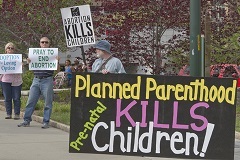 The message is clear: they are implying that taxpayer dollars are being routed from Congress and state governments at the rate of $11 a second to PP in order to fund slightly more than a half million abortions yearly in the U.S. That would amount to almost half of the total number of abortions performed in the U.S. However, they don't specifically say that. They merely display two large unrelated numbers, and expect you to jump to that conclusion. The taxpayer dollars appear to be in error. As of mid 2012, the display which is supposed to register the total government grants and contracts for the previous year, 2011, was still advancing by $11 a second. It would appear that the amount that PP received from taxpayer dollars for 2008/2009 was $363.2 million a year -- much less than is shown on the EPP web site. An article in the Washington Post stated that: "Federal law already forbids Planned Parenthood from using the funds it receives from the government for abortions." 3 Thus, if PP were completely defunded by government, only PP's preventative, educational, and disease treatment programs would be affected. Through its various prevention programs, PP estimates that they prevent over 620,000 unintended pregnancies per year. That would have resulted in about 220,000 abortions. If the approximately 400,000 unintended pregnancies that resulted in live births per year were not prevented as a result of services by PP, many more parents and their babies would place a heavy burden on social service agencies. 75% of PP users are poor. They have incomes below 150% of the poverty line. 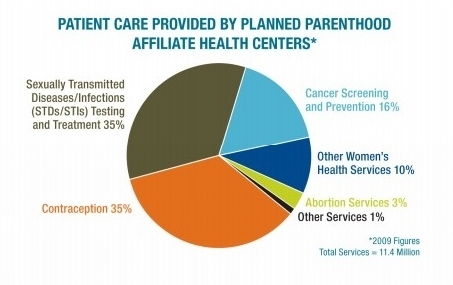 Without services from PP many would not be able to obtain contraceptive information. 35% were sexually transmitted infection detection (STI) and treatment. 16% were cancer screening and prevention. 10% were other women's health services. a major increase in the number of deaths among embryos, fetuses, youths and women. Thus, defunding Planned Parenthood by the Pro-Life movement would, in fact, be an anti-life development.